B U B B L E G A R M: I won a Isabella Oliver Dress! I won a Isabella Oliver Dress! I received my dress in this beautifully wrapped packaging. I entered a contest on Pretty Stylish London and to my surprise I actually won in a random draw, yay! :) All I had to do was go on to the website of Isabella Oliver and say what my favourite dress was. I had actually forgotten that I entered so it was just perfect! Isabella Oliver was launched in 2003, and has since become home to two fabulous women’s wear collections. Mixing the classic with contemporary; the Isabella Oliver 365 collection provides multitasking ready-to-wear, whilst the Isabella Oliver maternity collection features silhouettes loved by the A-list. The dress that was up for grabs was this gorgeous multi way maxi dress. Price: £180. However, unfortunately it was out of stock in my size! Boo hoo right? Instead I was offered the dress that I said was my favourite from their whole range. How lucky and convenient was that? The dress you see below is the Sevilla dress. It's 100% silk chiffon and I opted for it in the gorgeous berry colour as it really stands out. 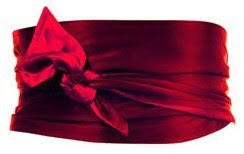 I was also sent the reversible wrap belt, one side is this berry colour, and the other side is a rich maroon colour. The Sevilla dress can also be worn on or off the shoulder. It just looks gorgeous with the belt. I'm so happy that I got the Sevilla dress as I will get much more wear out of it than the maxi dress! Aww hun you are going to look beautiful in that dress! Congratulations on winning - such an awesome prize. you are so so so lucky hehe cant wait to see pictures ! The dress and the belt look amazing! I can't wait to see you in those! Sooo Pretty cant wait to see how it looks on! OMG that dress is amazing i think i am a little bit in love with it !!! Great prize....I bet your happy! Amazing dresses and so stylish aswell! P.S! How did you make you header for your blog? I tried to make one on Polyvore.com but i don't know how to transfer it across! Great products. Thanks for sharing! Wow congrats on winning that. You are going to look beautiful. I can't wait to see you rock that Sevilla dress mehhnn, it's stunning! You lucky thing. Gorgeous dress and such a pretty color. Please post a pic of you wearing it. Am sure it will look amazing on you. Congratulations.